While we’re finally settling into the crisper days of fall and preparing for the colder months, we’ve been seeing blanket scarves pop up in stores and on bloggers. 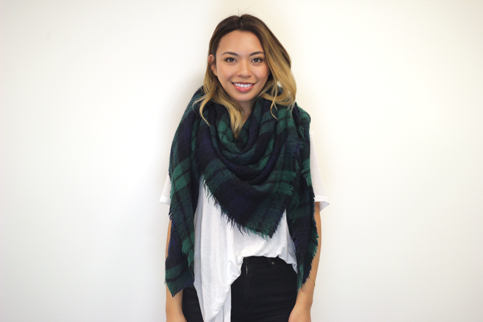 There’s something so cool and effortless about wearing an excessively large scarf. Of course there can be a sloppy or too blanket-esque vibe if you don’t wear it the right way. Here are four ways to wear a blanket scarf and to incorporate this cozy accessory into your cold weather wardrobe. 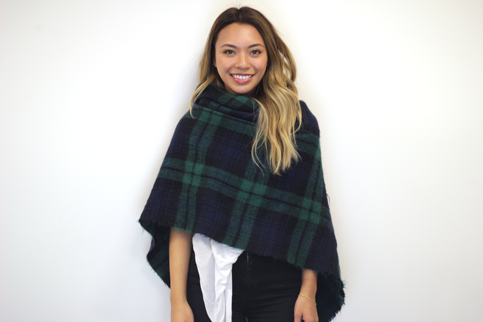 Let’s start with the most classic and easiest way to wear a blanket scarf. Thrown over the shoulder, there’s such an effortless vibe that this look gives off and is perfect for when you’re running out the door. If you’re in for a very cold winter, this method is great because it comes right up to your face for maximum coverage and warmth. Starting from one side, leave the end to about your waist and start wrapping the rest of it around your neck. At first, it’ll look a little crazy and bulky, but fiddle around with it until you get the perfect amount of scruffy and chic. If your blanket scarf is a square, fold it in half into a triangle to make the shape of it more flattering and that way, the longest part is in the middle where you need the most warmth. Sometimes if you’re moving around a lot, the ends of the scarf can fall off your shoulder, so in times like these, you can always turn your blanket scarf into an infinity scarf by tying the ends together and then wrapping it around your head a couple of times. This shawl, scarf, wrap hybrid is great for when you need an extra layer of warm on your shoulders in a very effortlessly chic way. 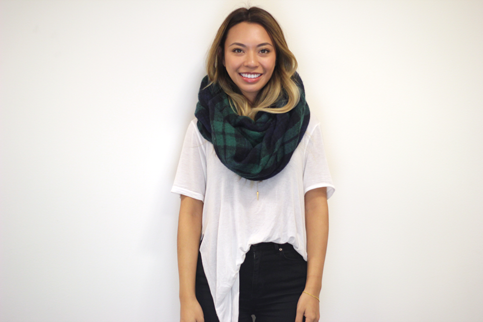 Start by draping the scarf over your shoulders. Take one end and bring it to the opposite shoulder, and tucking it underneath the other side of the scarf. Then, take the loose side and drape it across the opposite shoulder. You can tuck the end of it up by your neck to keep it from moving. 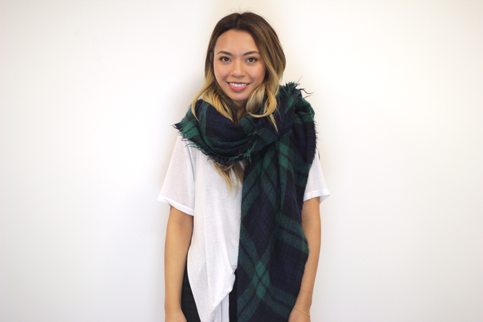 Our favorite way to wear a blanket scarf was number four. Which one is yours? Share in the comments!